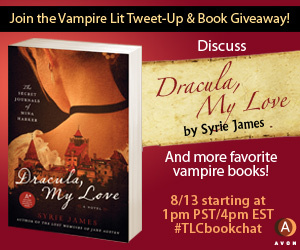 Remember on Monday I talked to you about this new vampire book and the great twitter chat they gonna have? Well I happen to have a copy to give you! Here’s the book description once more, but please go back to Monday's post to see the trailer! who everyone you knew was determined to destroy? Syrie James approaches Bram Stoker’s classic Dracula with a breathtaking new perspective–as, for the first time, Mina Harker records the shocking story of her scandalous seduction and sexual rebirth. Ends on August 21st, 2010.
to enter, Please FILL THE FORM! Don’t forget to visit back to see who won, you are responsible for claiming your prize! And for more chances to win, don’t forget to tune in on Monday for the twitter chat (they will give multiple copies)! I'd love to read this one! It's on my wish-list! Thanks so much! This book sounds great! I was certainly impressed with the excerpt - it was nostalgic, kind of like one of those older gothic novel (you're probably too young to remember, LOL) only better. Thank you for the giveaway. This book sounds really good. Thank you Tynga, for hosting this giveaway! I've had my eye on this one for a while! Sounds good to me. I'm always looking for new authors.